People are attentive to their diets more than ever these days, trying to eat in healthier or more thoughtful ways and making food choices that reflect nutritious, personal, or religious beliefs. Here in the USA there is one puzzling exception that has a strong presence in the American food scene and it’s called bacon mania. Mania means to have an excessive enthusiasm or desire for something, and the use of this tasty pork product in an increasing variety of recipess correlates with its growing demand. The more creative you can be with bacon, the more people like it, and food producers have become quite imaginative! 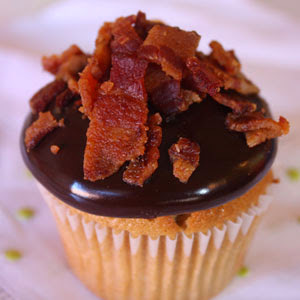 There’s bacon gum, bacon-wrapped hot dogs, bacon chocolate bars, bacon cupcakes, and bacon ice cream. bacon air freshener, a bacon wallet , or clean your teeth with some bacon toothpaste. I personally haven’t fallen for (I’m not captivated by) the current bacon mania trend but I think I’d like to try bacon ice cream.